An explosion of reds highlight the playful, immersive experience at the Giorgio Armani L.A. Lip Vibes Pop-Up at LAX that ran through June 15, 2018. 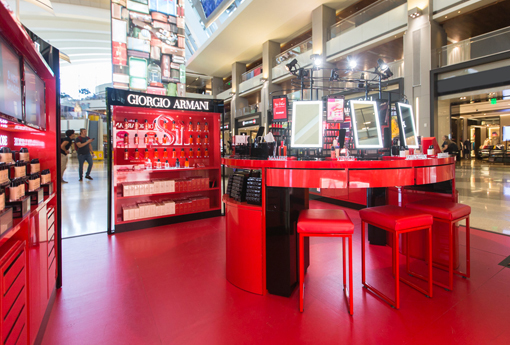 L’Oréal Travel Retail has teamed up with DFS to celebrate the vibrant colors of Los Angeles with an eye-catching Giorgio Armani Pop-Up store for L.A. LIP VIBES in Tom Bradley International Terminal at Los Angeles International Airport. Located in the main retail hall outside the DFS store, the 15-sqf Pop-Up store is running through June 15, 2018. 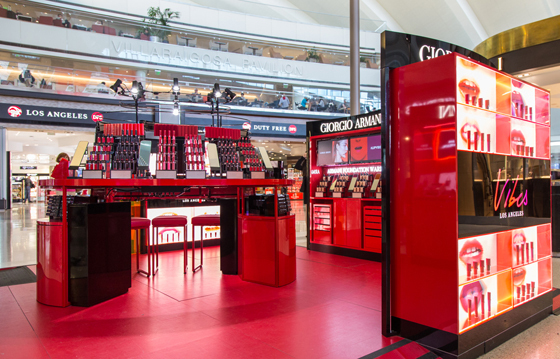 The Pop-Up offers a playful and immersive experience to discover Giorgio Armani beauty’s universe with an explosion of red spreads from wall to floor, surrounded by holographic bold lips and digital screens. A Lip Bar center stage features the full Giorgio Armani beauty lip wardrobe. It highlights the new couture LIP VIBES color collection of eight hues for the Giorgio Armani’s Lip Maestro and Lip Magnet lipsticks. Visitors to the Pop-Up will be able to preview eight ultra-saturated shades that are only available in selected shops. A “Beauty City Guide” will also invite travelers to try on four looks inspired by iconic Los Angeles hot spots – Malibu Sunset, Venice Neon, Downtown Vibes and Beverly Hills Spotlight. For travelers in a rush, Face Designers offer a quick ‘Kiss & Fly’ touch up. The Pop-Up also offers a selection of Giorgio Armani fragrances, including the latest Sì Passione. 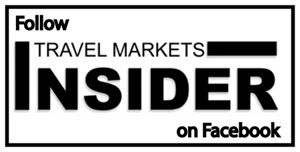 Passengers can also have purchases personally engraved and share their L.A. Lip Vibes experience with a selfie or an animated gif at the “Selfie ATM”, as well as on social media using the hashtag #LipVibes.